Down at the office the week before last, I wondered about an annual meeting that tends to take place in early February. One that I begin dreading the first week of January. This year, by the third week of February, there were no signs of it. I picked up my straight-out-of-1989 desk phone (which has no caller ID; I’m petrified every time it rings) and called a co-worker who’s usually somewhat involved with the meeting’s coordination. Too late, the meeting got underway less than 48 hours later. With regard to impulsive speak-ups like these, I’m a veteran, welcome to my war. I’m the most talkative introvert I know. Wearing a muzzle wouldn’t be the worst tactical approach. Conveniently enough, my dentist recently prescribed and issued me a customized nightguard, to control my teeth grinding and clenching routine. It is virtually impossible to speak clearly while it’s in. So now it doubles as a dayguard. While on the job, I tend to forget it’s in unless someone says something that absolutely necessitates a response. This lightweight powerhouse has already paid for itself. The less I talk, the better I plan. The less I talk, the more I move. The less I talk, the more some of what I’ve heard finally makes sense. 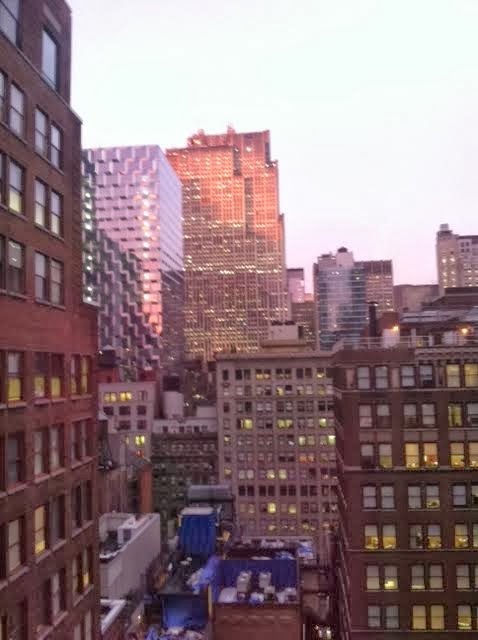 The less I talk, the more likely I am to gaze out my window and catch the final seconds of another dazzling sunset over the 30 Rock building, the kind that no amateur photographer can faithfully capture. What a view! Glad you are photographing it, but sorry to hear that you feel that "not talking" works better for you than "talking." On the other hand, it is the nature of writers to prefer writing, and you do it so well, so perhaps being reticent with the spoken word is what you were born to do. They say we should talk less and listen more to be better human beings. I honestly find that a tad difficult to do, not that I don't try. My sister also grinds her teeth in her sleep... too much daytime tension.